Over the last couple of days The Tavern's posts have received over 180 comments. The community has been engaged, and I want to engage it more. I offer my soapbox to others to stand upon, and I especially challenge the handful of commenters who disagreed with the week's posts to step up and submit a post or two on a gaming topic they feel passionate about. 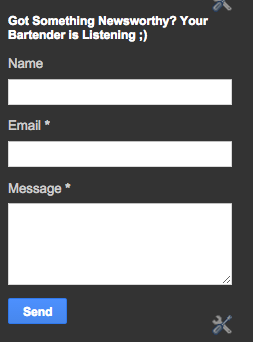 There is a contact form on the right side of this page. Use it to contact me and let me know what you want to post. It really is that simple. I'm up for the challenge. Please give me a week to think of something worthy of Tenkar's Tavern. I didn't see the form but I'm not all that bright. I would be happy to contribute a "My First Time" piece to share with the Tavern Community. I've been away from the game and culture for nearly 30 years but I still remember the First Time (I discovered the game). It was awesome. Y'all just let me know.